Most installation companies offer a wide range of finishing touches and additional extras to enhance your enjoyment of your new conservatory or orangery and to make it a comfortable all-year-round room. 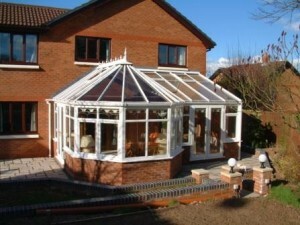 It is worth mentioning that the construction of a conservatory or orangery, especially if you choose from an extensive options list, requires the skills of a wide range of trades. Builders, joiners, glaziers, plumbers, electricians and heating engineers can all play a part in creating the finished article and like anything else – the more complex it is, the more can go wrong so planning your new conservatory and arranging the finishing touches properly is important. The logistical procedures involved in bringing together all the required trades people and the various products, all at the right time and in the correct order, so that the process appears seamless to you the customer, is an art in itself. A well-organised installation company will build a good reputation based on their organisational skills as much as the quality of their work. 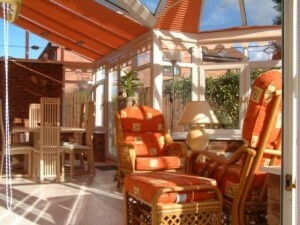 Just a Quote can introduce you to up to four professional conservatory and orangery installation companies. Most conservatory installation companies will include a number of electrical sockets in their quotation so that you can watch TV, listen to music or surf the web, or perhaps you need an outside socket for your lawnmower and other garden machinery. It is best to confirm this element of important finishing touches – don’t just assume that electrical sockets are included in your quotation. A conservatory is unlike any other room in your home so due consideration needs to be given to not only creating the atmosphere you want to achieve but also to do it without either creating dark corners or making it a beacon for your neighbours. A combination of different types and styles of lighting generally work best and there will rarely be simply one central ceiling (roof) light as in some other rooms in your home. Consider wall lights, down lighters possibly in the ridge and lamps on the floor or internal window board – some of which can be controlled by dimmer switches. Some installation companies will also offer to arrange a television aerial point, a telephone extension and extension of your broadband or sky™ connection. Although some people may carpet their conservatory, a mat or rug would be essential by the entrance / exit door to avoid dirt and mud spoiling your conservatory’s floor covering. Because of this, ceramic floor tiles and vinyl are popular, easily cleaned alternatives and there is an extremely wide choice of both. Once laying costs are taken into account, ceramic floor tiles would generally be the more expensive choice but would last much longer than soft floor coverings. In large conservatories, such as a P Shape combination style which can be used as more than one room, each area could be treated differently, with for example, carpets in the lounge area and ceramic floor tiles in the dining area. Under floor heating was employed by the Greeks and Romans in around 500 BC but can actually be traced back to 5,000 BC from archaeological digs in the Middle East. Modern under floor heating systems can use either hydronic or electrical systems. Hydronic systems use water, sometimes with anti-freeze added, which is re-circulated within pipes generally made from polyethylene. The fluid is heated by a boiler, pumped around a system of pipework underneath the floor and requires installers with skills similar to central heating installers. The addition of a chiller unit means that some hydronic systems can also be used to cool the conservatory. Electrical systems are used for heating only and use flexible heating elements often embedded in pre-formed mats which are normally much thinner than the pipework in hydronic systems and are also easier to install. As with many finishing touches for your conservatory, under floor heating should be planned form the outset, not only to be able to schedule the work efficiently but also for the sake of your budget. 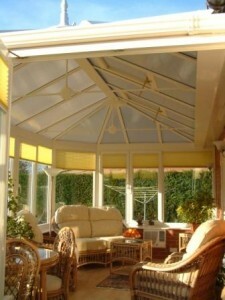 Most people spend more time in their gardens after having a conservatory built than they ever did beforehand. You will certainly spend more time looking at it – from within, so there is no better time to consider a garden makeover than when building your conservatory. Paving and landscaping around your conservatory can be one of the more important finishing touches for your conservatory but it is often forgotten until after the conservatory has been built. It makes even more sense if you are considering any hard landscaping such as patio areas, garden walls and steps as these can be constructed at the same time as the conservatory base and walls, often by the same builder, with matching materials. Planning your garden is just as important as planning your conservatory and consideration should not only be given to the style and specification but also to budget. Some soft landscaping such as shrubs and plants may have to wait, as may garden furniture, but these are both things which can be added easily at a later date when your budget permits. A popular method of keeping a conservatory or orangery cool – at the same time as providing a degree of privacy – is by installing window and roof blinds. A wide choice of blinds is available but pleated, roller and Venetian blinds are probably the most popular of all finishing touches for your conservatory. Blinds can also be installed in the roof but for conservatory roofs with triangular panels these can be quite expensive and the cost should be factored in at the time of budgeting for your conservatory – it may even convince you to choose a different type of glazing (such as solar control glass) instead. Traditionally, the type of furniture used in modern conservatories and orangeries has reflected the concept that a conservatory is a ‘half-way house’ between an internal room and an outdoor seating area. Consequently a typical conservatory has less bulky furniture than say, your lounge would have, and the stereotypical cane furniture and a coffee table became the choice of many. Advancements in the design and manufacture of conservatory-style furniture, together with changes in fashion, have partly consigned these products to history. Further advancements in conservatory glazing, heating and cooling systems for conservatories and orangeries have resulted in them being genuine all-year-round rooms and consequently the type of furniture used has reflected this. Conservatories and orangeries are often furnished so that they can be used as a second lounge, dining room, hobby room, playroom for the children or even an office. Whichever you choose, conservatory furniture is one of the more important finishing touches for your conservatory. Many customers decide to individualise their conservatories and orangeries by including decorative glass features and there is a wide choice of leaded glass, coloured lead, bevelled glass, Georgian Fret and Astragal Bar. Our opinion on decorative glass is that windows are to look through, not at’and this is more often the case with conservatories than with windows and doors. Views of attractive gardens through the large expanse of glass which conservatories and orangeries naturally have should not be spoiled.